Harvard's 10-year plan for Allston includes an addition to Harvard Stadium and construction of new buildings, as seen looking northeast from Allston back toward Cambridge. 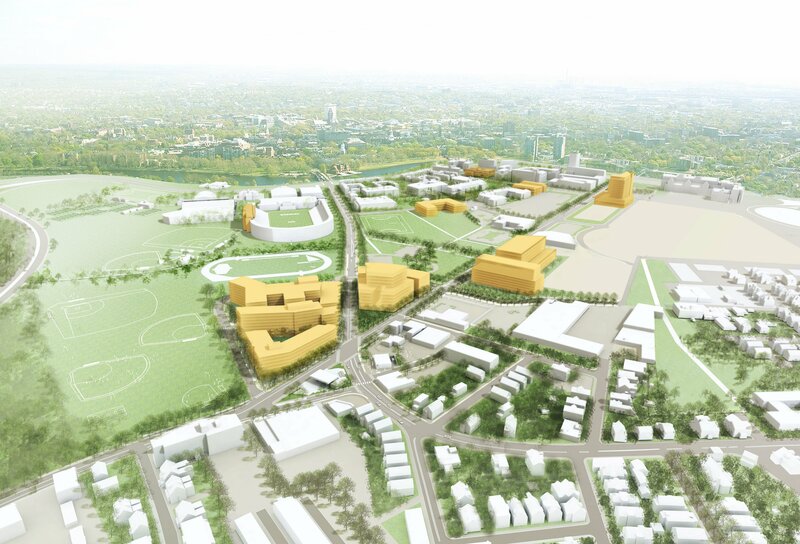 The Boston Redevelopment Authority (BRA) voted unanimously on Thursday night to allow the University to move ahead with its Institutional Master Plan (IMP)—nine projects totaling 1.4 million square feet for Harvard’s expanding campus across the Charles River in Allston. The approval establishes overall zoning guidelines, but each project will have to undergo further individual review, and comes as Harvard is about to commence site preparation for a previously approved Science Center on Western Avenue, said University officials. The nine projects include: an addition to Harvard Stadium that will add indoor seating and office space; a new, larger, basketball gymnasium; a 150- to 250-room hotel/conference center located on Western Avenue across from Harvard Business School (HBS); and various renovations and additions to HBS’s campus, such as a new auditorium for Burden Hall, faculty and administrative offices, and renovation of the adjacent Soldiers Field Park housing complex. The IMP also sketches Harvard’s long-term vision for its Allston campus, which—while in no way binding—would in future decades transform the area from paved, vehicular-oriented, industrial and commercial uses to others similar to those of Harvard Square and its environs, with walkable green spaces, numerous transit options, retail districts centered on road intersections, and permeable, shady quadrangles with many substantial academic buildings.